Banking sector is a highly dynamic area with challenging competitive pressures like changes in customer requirements, stringent regulations and the need to adopt new business models. The pressure is more on streamlining operations and enhancing core processes to make them more efficient and customer friendly. IT systems, software and related technology developments offer support for banks to overcome most of their competitive pressures. Computerization in banking sector started during 1980s and is still evolving with the advent of new technologies. Banking sector since the last decade is constantly investing on IT to enhance their capabilities by adopting new technologies. Technology adoption is largely driven by changing business trends and globalization which has a direct impact on banks as customer needs evolve in the form of online banking services and transactions. Banks are rolling out core banking solutions in cloud SaaS model to benefit their customers with online access. In addition to these changes, the increased trade flows within regions enabled by the world-wide-web and e-commerce is contributing to IT investments and latest technology adoption by banks. For instance, the use of smart phones by customers is forcing banks to rapidly improve their online services. The Indian banking sector is likely to witness huge growth prospects in the coming years and will extend into the next decade. According to KPMG-CII report India is expected to become the fifth largest banking industry in the world by 2020 and will be the third largest in the world by 2025 as the country’s GDP growth appears promising. Innovative customer engagement: Digital channels such as social media networks provide access to large number of users. These channels present banks with unique opportunities to deliver customized solutions and services. Digital channels also foster communication with customers at individual levels thus strengthening relationships. Data is fuelling innovation in banks: Data available in various sources on the internet provides unique opportunity for banks to capture them and use it to their advantage. IT platforms and tools can analyze huge volumes of data for identifying meaningful information which banks can use in their product and service strategies. Big data tools and in-memory analytics are mostly used by banks to draw insights and realign their products to satisfy existing customers and to leverage new customers. Security systems to minimize fraud: Digital transactions from multiple devices are proliferating at high rates. This proliferation also opens up security issues because banking transactions online must be protected from hackers who try to exploit vulnerabilities in the systems and steal sensitive data. The increasing portfolio of products and delivery channels and trends such as e-commerce and mobile commerce with payment gateways need to be secured well to prevent data leaks. Cyber risk management in banks is quite complex, however IT outsourcing from data centers can take care of this critical area and prevent data theft or fraud. Banks in order to secure their data and services need to engage sophisticated security systems which are ensured by data centers and cloud service providers. Mobile banking: Customers are increasingly using mobile devices largely in banking transactions. Most of the banks offer mobile banking services to their customers and are adopting this technology to develop client relationships. With mobile banking customers can check their account information, withdrawals, payments, transfers and generate mini statements, etc. all from their smart phone. Mobile banking is a popular trend adopted by banks in servicing customers. Business Intelligence: Banks stand to gain from predictive modeling and analysis to fine tune their product and service strategies. For instance, analytics helps banks to invest in channels that offer greater potential for ROI based on customer behaviour and are flexible to market demands. BI involves predictive modeling and analytics which require flexible computing capacities with centralized data stores. Banks adopting such IT systems benefit through lower operational costs, flexibility and deployment capabilities to result in improved time to market. Core-Banking on SaaS: Banks provide core banking services online for customers to enhance significant efficiencies in their operations. Implementing core banking services on the cloud SaaS (Software-as-a-Service) model offers the ability to service customers anytime, anywhere and even when they are mobile. The pay-as-you-go pricing model in SaaS allows banks to save costs on deployment and maintenance of hardware and software as opposed to in-house IT. Banks are able to understand customers well through social networking platforms and other digital channels. Using these channels banks strategize their services for targeting individuals and able to efficiently communicate information. Cloud SaaS service models provide the advantage of scalable IT infrastructures and multiple operating platforms for deploying applications along with infinite resources thus saving banks from capital expenditure on purchasing hardware and hiring IT personnel. Banks having the ability to access data anytime and derive information are likely to be more competitive in responding to customer needs quickly. With latest trends and user friendly technologies in IT, the banking sector is poised to increase their operational efficiency and profits by responding quickly in the competition. 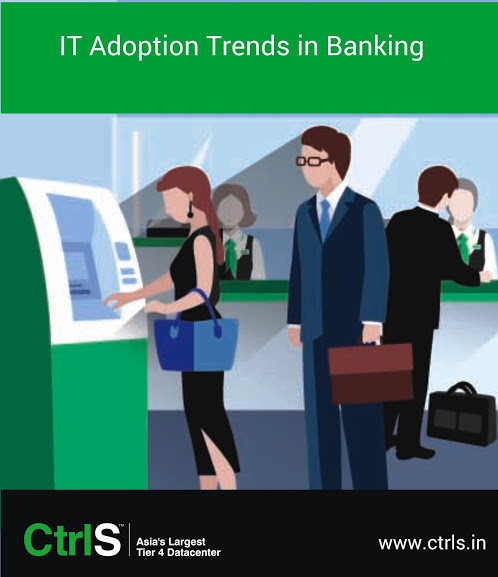 This entry was posted in IT adoption and tagged it adoption, it adoption trends, it adoption trends in banking on January 11, 2016 by admin. Information technology is surely proving to be a game changer in healthcare sector along with other business sectors and industry verticals. Healthcare services offered by private sector hospitals are viewed as a major force behind technology adoption in this coveted segment. Emerging trends such as wireless technologies and cloud computing systems offer the ability to provide health care information anytime, anywhere and can be accessed using multiple devices. Healthcare sector offers immense potential for IT services and solutions. The focus of healthcare service providers or hospitals is to optimize a variety of healthcare related tasks. Healthcare tasks include, managing operations efficiently related to healthcare delivery, patient care, reporting or management information systems (MIS) and integrating data between different departments (for example, pathology, radiology, intensive-care, etc.) among many others. Technology allows information sharing across hospitals, act as patient referrals and disseminate knowledge related to certain specific illnesses. The main objective is to have an enterprise wide comprehensive health information management system (HMIS) for enhancing healthcare service delivery which is made possible through technology adoption. IT enables easy accessibility of healthcare data and helps to overcome the issues in manual processing of health data. According to one survey done by Healthcare Informatics in 2014, cloud computing is widely preferred by the healthcare sector showing an adoption rate of 83% worldwide and this market has the potential to generate $9.48 billion revenues by 2020. Cloud computing systems also provide data privacy, patient confidentiality and security which are highly required by hospitals to protect their knowledge and vital health information assets. Maturity at organizational levels: The trend namely ‘innovation center of excellence’ followed by organizations is paving the way for healthcare and life sciences firms towards aligning their resources in innovative ways – for example, Pfizer views innovation across its pharmaceutical divisions to ensure long-term capabilities for the organization. Innovation, collaboration and information sharing is easily enabled by IT and cloud based systems which is always tied to success and competitiveness. Data science movement: This is one exciting development in healthcare today, HMIS professionals seek to bring more meaning and identify insights by making use of existing data. The availability of big data in healthcare analytics is taking center stage and already companies are investing in healthcare analytics solutions that provide wisdom on improved healthcare for patients. Such voluminous processing and handling of large datasets require high performance compute, storage and bandwidth resources. Liquidity of Information: Data liquidity is another trend which emphasizes on interoperability. Without interoperability the desired healthcare outcomes of populations cannot be achieved. Nowadays, electronic medical records (EMR) are designed to be interoperable which is made possible by open source platforms and certain development environments. Data centers and cloud service models, especially SaaS environments provide the needed interoperability in EMR for accessing data across multiple operating environments. Data Security: With interoperability, security is a big issue. Security in healthcare information is crucial because the right information must be sent to the right person at the right time thus protecting patient privacy and data integrity. Security is also highly desired by hospitals to protect their vital knowledge related to illness and treatment procedures. Cloud services offered by data centers provide multiple layers of in-depth defense to ensure security at different user levels in any healthcare organization. Clinical Innovation: The trends of data science and innovation aims to result in patient empathy and improved approaches to drug development and healthcare delivery. During the last decade, healthcare industry has opened up by sharing large amounts of online information which is made possible by emerging technologies and the worldwide web. Pharmaceutical giants such as Pfizer, GSK, Johnson & Johnson and many others feel the need to adopt emerging technologies in their research for better drug outcomes. Further, technology enables healthcare companies to innovate and quickly test new medical interventions, procedures and methods which otherwise would normally take long time to develop and implement in the absence of technology. Further technology supports healthcare experts to provide directives on disease outbreaks and to provide information to rural populations for prevention and care. Improved collaboration and efficient information sharing and work flows between all stakeholders in healthcare sector. According to Clinical Innovations + Technology, 1 out of every 3 patients expressed satisfaction that digital communications play a significant role in improving their health. Leverage big data analytics and analysis tools for supporting research in identifying new drugs for improved clinical interventions. According to McKinsey Global Institute, the use of big data technologies in drug and clinical trials has the capacity to generate US$ 100 billion annually. Disease data sharing between hospitals for better clinical interventions but protecting patient privacy. Clinical innovations through analysis of EMR, EHR. According to Accenture Consulting report on Health Tech Vision-2015, 54% patients are finding mobile devices and apps as advantageous in health monitoring and 28% physicians use computerized records routinely for clinical decision making. In addition to the above, there are many more advantages to show the benefits of technology adoption in healthcare services. According to PWC report on healthcare, the global healthcare business is pegged at US$ 9.29 trillion in the coming years. Healthcare professionals must understand that technology is only a tool for integrating information from various stakeholders including patients and not a substitute for treatment or physicians. Overall, the healthcare sector is more poised to embrace emerging technologies in the coming decades due for their functionalities, efficiency and easy accessibility. 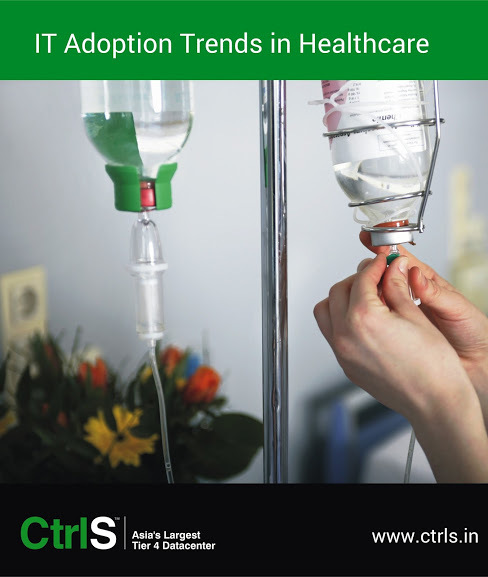 This entry was posted in IT adoption and tagged it adoption, it adoption in healthcare, it adoption trends in healthcare on January 7, 2016 by admin. Insurance companies are investing heavily in IT and related technologies to improve customer experience and reduce operational costs. The advent of new technologies and tools such as SaaS, big data analytics, business intelligence, etc. are offering insurers with solutions to improve efficiency in their core and non-core systems. Recent technology trends support insurers in strengthening customer interactions, target potential customers and provide usage based insurance. Digital technology is a global megatrend which is transforming a variety of industries that includes the insurance sector. Insurance sector has been a bit slow to IT adoption due to rapid changes in technology and also because their distribution channels are still conservative, i.e., handled by agents and brokers and were in fact not ready to adopt new technology. However, digital technologies adoption by customers that include social media, smart phones, electronic transactions, etc., enabled by cloud service models, e-commerce and mobility are making an impact on the technical and commercial capabilities for many insurance companies. Insurers are quick to capitalize on this trend. According to EY survey on ‘Global Insurance Market Trends’ the insurance sector is growing and offering potential markets for insurance companies particularly in the Asia-Pacific region. The current growth for insurance in Asia-Pacific region is around 39% of the total world’s economic growth. In the context of India, the insurance sector is having a market share of US$ 60 billion and is expected to increase four fold in the next decade. As per the Indian Brand Equity Foundation (IBEF), December 2015 estimates the general insurance business in India is expected to grow at 17% in the coming years. All this growth generates huge volumes of data and customer information. EY Global Consumer Insurance Survey 2014 report highlights the need for strengthening customer relationships to achieving customer loyalty in insurance services. This is becoming a strategic imperative for insurance sector to encompass all product categories, geographies and to incorporate complete range of operating models. Growth in terms of increasing insured customers would need superior IT environment and platforms to respond effectively and engage customers with updated information and communication all the time. Collaborate with partners to launch innovative products in areas such as micro-finance, wealth management, etc. Digital technologies have the ability to intersect and establish interdependences with different insurance functions and enable collaboration. 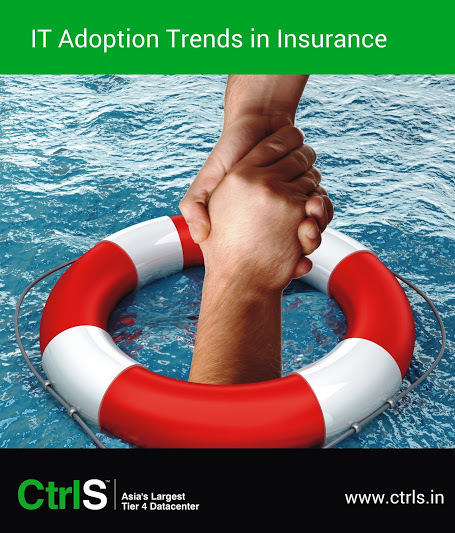 Based on the above business drivers, the following IT adoption trends can be currently found in insurance companies. Social media analysis: Insurers are turning to social media as a marketing medium and a platform for collaboration. Social media is widely used for networking with friends and business partners. The usage of social media is made easy by smart phones and mobile devices. Insurers are able to target new customers based on their life events and also use social media networks to communicate with internal and external stakeholders. Focus on SaaS solutions: Insurance companies are deploying applications by adopting SaaS solutions because it offers superior infrastructure, high levels of security and low risk. Insurance companies have the advantage of access to latest infrastructure and IT platforms at low cost. SaaS offers a perfect solution for insurance to improve their efficiency at minimal capital costs. Real time architectures for agility: Real time data sources are mobile technologies and social media which can be leveraged by insurance companies to become more competitive. Capturing real time data from online channels is proving a gold mine for insurance companies because they provide insights on customer behaviour based on which insurance products are strategized. Insurance companies are deploying data analytics tools, BI platforms and data visualization tools to derive full benefits of real time data. Data analytics and big data: The ability to capture real time data, big data and analytics play an important role for insurers in terms of potential customers. The recent trend is the adoption of sensor technologies named telematics used to monitor driving behaviours of the individual. These technologies help insurance companies to provide usage-based insurance policies. The above trends offer immense benefits for both, the insurer and the insured. Social media is proving to be an effective tool for insurers to garner more leads, remediation and retention of insurers along with targeting new potential customers. SaaS adoption significantly reduces cost and lead time for implementing IT systems and applications. Mostly SaaS is outsourced from data centers therefore insurance company can save cost in IT hardware and in hiring IT staff. Development of new products and strategies are possible from data analytics tools that provide customer insights. BI and data visualization tools enable competitiveness and agility. Information plays an important role in the insurance sector in terms of product pricing, development, risk management, claim processing and fraud detection. These functions can be executed by collecting data from multiple sources and by using software tools to obtain meaningful insights from data. In order to effectively implement insurance operations, insurance sector needs to adopt IT systems, new technologies and networks to capture real time data and bolster their data storage capacity for analysis in order to capitalize more customers. This entry was posted in IT adoption and tagged it adoption, it adoption in insurance, it adoption trends on January 4, 2016 by admin. IT adoption in manufacturing is increasing in terms of automating industrial and transactional process capabilities. According to MintJutras research, the adoption of cloud services in manufacturing is expected to grow by 45% in the coming years. Already 22% of all manufacturing and distribution software across the world are deployed in SaaS cloud model. Cloud based systems are mostly preferred by manufacturing firms due to their characteristics such as control over upgrades, flexibility and optimization characteristics. Manufacturing is a highly dynamic industry which is vulnerable to volatile business cycles and changing markets. Manufacturing encompasses a variety of functions such as product engineering, services, product lifecycle management, scope for new or improved products in potential markets and so on which offer significant opportunities for manufacturing firms. However in spite of the opportunities and potential, manufacturing firms have to cope with competition, changing regulations, cost and margin pressures which are big challenges. IT adoption in manufacturing is largely driven by industrial automation systems and operational management systems. Industrial automation systems make use of technologies namely PLC, HMI, SCADA and so on which have a direct impact on the quality of physical goods produced whereas operational management systems are more focused on automating manual processes through the use of robotics, wireless and mobile applications, reporting dashboards and fully automated workflows. In the case of India, the manufacturing firms are mostly business entities that deliver end products directly or indirectly to customers. These firms work towards gaining competitive advantage through innovation and new product launches. The above inescapable challenges play a significant role in affecting product accuracy, executing processes in scale, capitalizing on intelligence and in the development of relationships with suppliers, distributors and all stakeholders. Almost all manufacturing sector companies commonly look for short time-to-market schedules to sustain themselves in competitive markets. IT strategies using emerging technologies such as cloud computing offers the potential for manufacturers to leverage innate intelligence and knowledge into improved business value. IDC in April 2015 explained that there is an accelerating trend across manufacturing firms worldwide to adopt cloud service models as its mainstream operations. Interestingly cloud based SaaS model is preferred by manufacturers to deploy applications such as financial accounting and ERP, CRM, Sales and marketing automation and email. 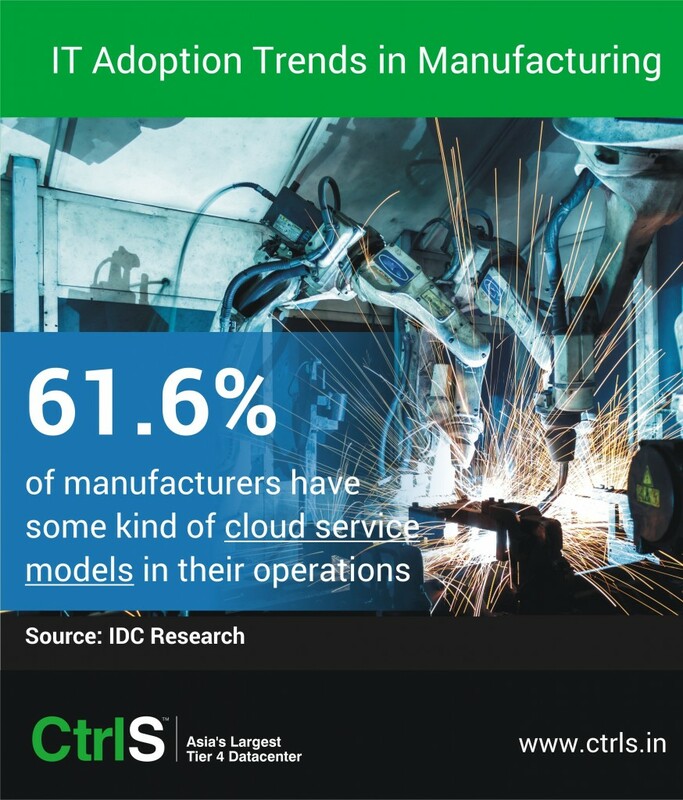 IDC survey on IT adoption in manufacturing indicates 61.6% of manufacturers have some kind of cloud service models in their operations while others are considering new technology adoption to replace existing IT services. Cloud enabled supply chains: Today’s manufacturing landscape is more inter-connected and interdependent thus requiring more collaboration and links with supply chain partners in multiple locations. This scenario can be found in manufacturing firms that cater to customers beyond their geographical boundaries. Such companies are more likely to adopt cloud services to run web based applications to provide real time visibility, become more responsive to customer needs and support to customers. Analytics and mobility: Business intelligence and knowledge are derived from analytics software which churns internal and external data to provide actionable business insights and knowledge. Manufacturing companies that rely on built-to-order or configure-to-order strategies as their core business model would need high-end IT capabilities to capture knowledge, provide mobility support for analytics, business intelligence reporting and analysis. Cloud based systems provide the much needed flexibility in configure-to-order and built-to-order models as they can scale or descale based on production volume. Further cloud systems support multiple mobile devices which can share information on the go. Workflows, collaboration platforms and dashboards: Manufacturing companies deliver real-time status and forecasts and implement applications such as the vendor managed inventory (VMI). Cloud service models enable such firms to fully launch supplier portals and collaboration platforms that provide dashboard information to the management and automate workflows. Dashboard software is also used to report status of each transaction in each branch which is mostly sought by the management, even when they are mobile. Collaboration platforms support product lifecycle management and to launch of new products quickly thus getting an edge over competitors. This strategy is more widely adopted nowadays to overcome problems in time-to-market objectives. Automated customer service and support: Customer support and helpdesk is a critical function to maintain good reputation in markets. Automating online customer service inquiries by integrating them with content management services to handle order processing, pricing, and logistics can be made more efficient and effective by adopting cloud SaaS service models. Manufacturing firms benefit by cost and time advantages through automated customer support. Increased reliance on two-tier ERP systems: ERP implementation strategies provide advantages in material planning, supplier management and at the same time reduce costs and overheads. Large manufacturing firms stand to gain more independence by adopting two-tier ERP strategy thus minimizing their dependency with one ERP vendor. Two-tier ERP systems take care of scaled down operational needs through programming and customization. Cloud based services are the best option to implement a two-tier ERP strategy because the IT infrastructure and operating environment is readily available in their service models, resulting in capital savings on IT infrastructure for manufacturer. The above trends indicate that IT adoption plays a significant role in manufacturing. IT adoption trends in manufacturing focus on the capacity to drive business strategy and competitive high growth to achieve profits. Therefore companies that strive to achieve superior operational efficiencies should adopt an integrated IT system that converge industrial automation and transactional business management. Such IT systems to work efficiently need high performance compute, network and storage capacities which are available in cloud service models easily from data centers for adoption. This entry was posted in IT adoption and tagged IT adoption in manufacturing on December 21, 2015 by admin. E-commerce companies in order to facilitate sellers and buyers online adopt new techniques and methods which are easily enabled by emerging technologies. The rise of mobile technologies and social networks are complimenting online users and businesses by acting as a catalyst to accelerate the e-commerce trends in the Indian market. In all these trends, IT is clearly proving to be an enabler to connect consumers and provide a variety of information and choices in just a click of the mouse. Since the inception of online business transactions, e-commerce has come a long way and continues to grow rapidly. Consumers’ online behaviour and interests create knowledge for e-commerce companies to analyze behaviour patterns and customize their online shopping experience. In a study done by Accel Partners in 2015, it is estimated that online shopping business in India is expected to grow at $8.5 billion in 2016 and beyond. This estimate is based on the number of growing online users which is already 300 million in 2015. IT adoption in e-commerce can transform business operations into real-time transactions conducted worldwide with accuracy. 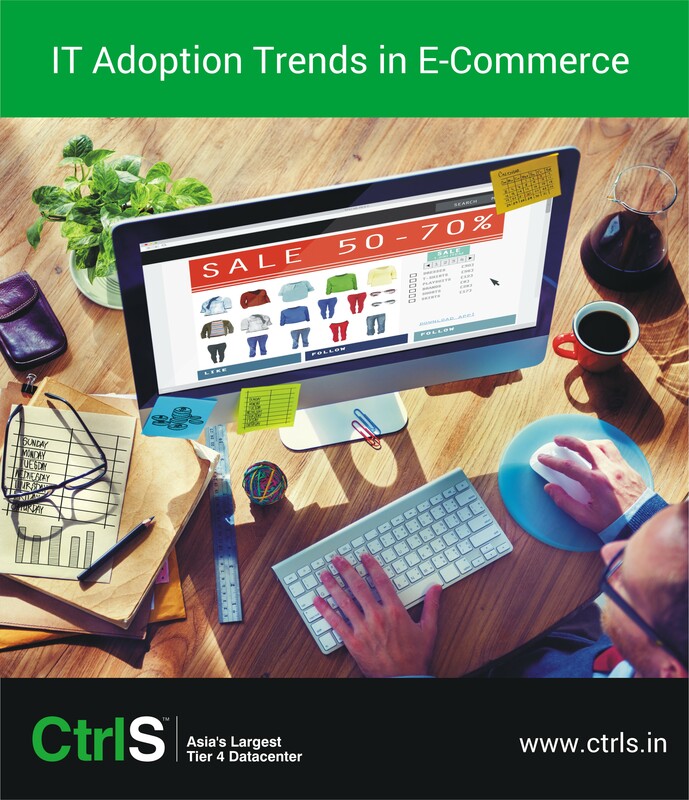 In fact, IT adoption in e-commerce is acting as a catalyst in driving globalization. Using technology, e-commerce companies are able to measure the amount of transactions and make predictions for future transactions from available data. Globally, IT adoption rate shows that online sales is growing at a rate of 20% which is made possible by technology that enables social media platforms, online shopping and online marketing strategies. Guided digital assets: IT enables the provision of how-to videos, manuals and step-by-step guidance on products and services. This is gaining more prominence and welcomed by customers. Customers are interested in getting complete details and higher level information while buying rather than reading generic information. High level content when combined with easy navigation and guidance in all the stages of transaction enable users to seek more online products or services. Marketing and personalization: IT is enabling customers to configure and personalize their product selection which is another trend. Marketing professionals use analytics to profile customer needs, suggest buying options. Digital marketers also target online users with products and services by using their browsing behaviour, demographics and browsing history. Personalized recommendations and ad retargeting is proving to be effective in creating an impression with online users. For instance a user after having browsed certain products will be able to see those product ads in subsequent websites as they continue their online journey. This marketing technique is used by e-commerce companies to gain new customers. IT offers the tools and applications to facilitate this trend. Mobility and mobile apps: As people seek more information on their smart phones, mobile marketing is also gaining prominence. Integration of transaction functionalities in mobile devices allows a user to make online transactions. The increasing proliferation of mobile users helps online business companies, but the e-commerce portal must have capacities to handle large volumes of data to perform transactions accurately. The adoption of cloud service models in e-commerce is ideal to handle transactions at scale. The role of social media platforms: A majority of e-commerce firms use popular social media platforms such as Facebook, Twitter or Pinterest, etc., to reach their potential customers. With social media it becomes easy to interact with customers and understand their interests. Social media is proving to be an effective digital marketing tool and widely integrated within the e-commerce industry because it becomes easy to reach large number of customers quickly. Further, product and service feedback in social media channels make an effective impression on the minds of social media users. The use of emerging technologies such as big data tools and analytics for gaining business value is easily facilitated by IT services namely, the cloud based SaaS model. Loyalty programs and support: IT adoption facilitates e-commerce firms to devise loyalty programs with rewards for partners and discounts for customers easily, because all of them are well connected. Further help desk and support are made more efficient for customers through IT. Customers expect a seamless shopping experience which is enabled by the integration of CRM systems with point of sale to complete a transaction. As e-commerce businesses take advantage of these trends fostered by technology, choosing the right technologies is important to successfully gain business value. As new technologies are developed, agility is also crucial to make things work together by focusing more on sales and customers rather than focus on IT infrastructure. IT infrastructures for e-commerce are easily available from data centers offering cloud service models provide a variety of technology options for e-commerce businesses to reach customers globally. This entry was posted in IT adoption and tagged it adoption in ecommerce on December 19, 2015 by admin.